“My name is Tess Turner – at least, that’s what I’ve always been told. I have a voice but it isn’t mine. It used to say things so I’d fit in, to please my parents, to please my teachers. It used to tell the universe I was something I wasn’t. It lied. It never occurred to me that everyone else was lying too. But the words that really hurt weren’t the lies: it was six hundred and seventeen words of truth that turned my world upside down. Words scare me, the lies and the truth, so I decided to stop using them. I am Pluto. Silent. Inaccessible. Billions of miles away from everything I thought I knew. Annabel Pitcher is a very popular and critically acclaimed author within the YA community with success for her first two novels Ketchup Clouds & My Sister Lives On The Mantlepiece. Silence Is Goldfish is her third and most recent novel. I won this book in a Twitter giveaway which I was thrilled about because now I had a starting point for her work. And I really really adored this book. 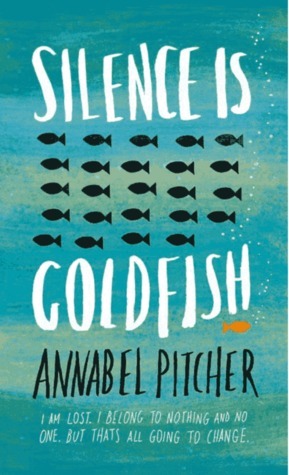 Silence Is Goldfish follows Tess who, after discovering a secret her family kept from her, decides to go mute and not speak to anyone, including teachers & fellow pupils at school like her best friend Isabel. And the only conversation she has is in her head and with a goldfish torch that she buys. At the core of the story, it’s a story about relationships and trust. I don’t want to spoil what happens but Tess ends up reading something on her dad’s computer that ends up making her question her whole life. This leads to her becoming mute and how she navigates through school & life as a mute. The main relationship the novel explores is the relationship between Tess & her parents. I really liked the relationship with her parents because it showed that parents have flaws too. I think we always, unintentionally, put our parents on a pedestal that we do forget that parents make mistakes as well. And that made the book so much more realistic, for me. This is a really great contemporary fiction novel that I highly recommend, that’s not just for young adults. I think if grown ups read this, it would possibly make people understand the teen age more. Before this book I never realised how seriously being silent is taken. People like to note to me whenever I’m quiet but I’ve never realised that it can be seriously worrying for people. After all silence can be the loudest scream. Next Next post: Moments in April.